Description - The Osprey is a large, long-winged bird that is dark brown above and white below with a white head and a prominent dark eye stripe. 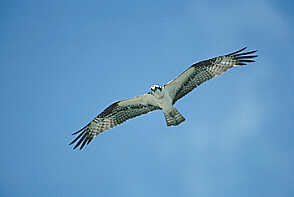 The male Osprey is usually all white below whereas the female has a necklace of dark streaking. The wing has a distinctive bend at the "wrist" and from a distance can resemble a gull. A loud, musical chirping characterizes the voice of the Osprey. Distribution - Ospreys breed from Alaska, north-central Canada and Newfoundland south to Arizona; they winter in North America north to the Gulf Coast and California. They inhabit lakes, rivers and seacoasts. Biology - The Osprey searches for fish by flying and hovering over the water; when prey is sighted the Osprey dives, its talons outspread and splashes into the water. The nest is a bulky mass of sticks and debris placed in a tree, on a telephone pole, on rocks or on the ground; 2-4 white, pink or buff eggs splotched with brown are laid there. Due to the use of pesticides, Ospreys declined drastically in the 1950's and 1960's, but since then they have slowly made a comeback.